S&P 500 - Despite all of the hysteria about a ‘Trade War’, the SPYs were flat this week. Technology - The XLKs are testing and may be breaking an important level. There is support around the $71 level because it was the previous all-time high in March. Financials - The XLFs have been range bound since March, but now they are approaching the lower side of the range. Healthcare - The XLVs have been consolidating around the $85 level since breaking their recent uptrend. Consumer Discretionary - The XLYs have been consolidating between $110-112 after breaking their recent uptrend. Industrials - The XLIs have been trending lower since failing at resistance around the $76.50 level. Consumer Staples - The XLPs are consolidating above the important $50 level. This level was the low in 2016, and the top of the range throughout 2015. Energy - The XLEs failed at $78 after becoming overbought in mid-May. This is the same level that they found resistance at in January. Materials - The XLBs are trending lower after breaking support at the $60 level. There was support there because it was the top in April and May. Utilities - The XLUs have been consolidating between $49 – 51 since the middle of May. They are now testing the top of the range. 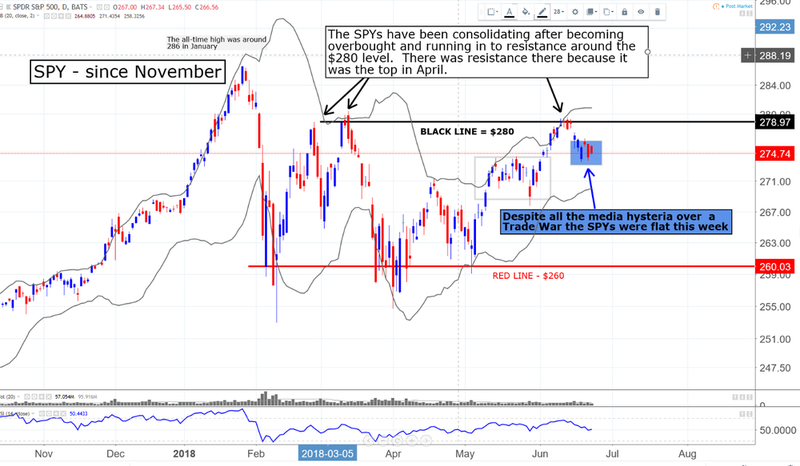 S&P 500 – Despite all of the hysteria about a ‘Trade War’, the SPYs were flat this week. They have been consolidating after becoming overbought and running into resistance around the $280 level. There is resistance there because it was the top in March. The lows this year have been around the $260 level. The recent all-time high in late January was around the $286 level. 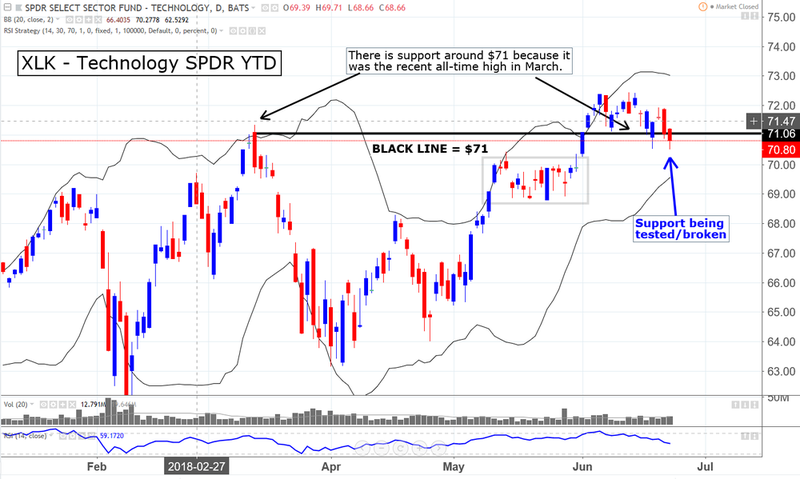 Technology – The XLKs are testing and may be breaking an important level. There is support around the $71 level because it was the previous all-time high in March. If this level breaks it will bring the broader markets lower. This sector is 28% of the S&P 500 makeup. Financials – The XLFs have been range bound since March, but now they are approaching the lower side of the range. The last three times they traded down to levels around $26.80, in late March / early April, and then again twice in May, they rallied. Friday’s close was $27.07. This sector is 14% of the S&P 500 makeup. Healthcare – The XLVs have been consolidating around the $85 level since breaking their recent uptrend. If they go higher here will probably be some resistance around the $86.50 level because it was the top in February and March. There is support around $84 because it was the top of the recent range. This sector is 14% of the S&P 500. Consumer Discretionary – The XLYs have been consolidating between $110-112 after breaking their recent uptrend. The recent lows in February and April were around the $98 level. This sector is 13% of the S&P 500. Industrials – The XLIs have been trending lower since failing at resistance around the $76.50 level. This had been the top since mid-April. They are now oversold and approaching levels that were support previously. The recent lows in November, February, and early May were around the $71 level. There will probably be a bounce soon. This sector is 10% of the S&P 500. Consumer Staples – The XLPs are consolidating above the important $50 level. This level was the low in 2016, and the top of the range throughout 2015. It was also the top throughout May and early June. This sector is 7% of the S&P 500. Energy - The XLEs failed at $78 after becoming overbought in mid-May. This is the same level that they found resistance at in January. They also hit resistance and rolled over at this level in December of 2016. They just found support again around $74, which was also the low at the end of May. There is support here because it the top in late April. Now they are in the middle of that range. This sector is 6% of the S&P 500. Materials - The XLBs are trending lower after breaking support at the $60 level. There was support there because it was the top in April and May. They are trading at the same levels that they found a low at last month so they may rebound a little. This sector is 3% of the S&P 500. Utilities – The XLUs have been consolidating between $51 - 49 since the middle of May. They are now testing the top of the range. $49 has been the bottom of the range since March. This sector is 3% of the S&P 500.